Monty Python’s Life of Brian. As part of our open weekend Shabbaton, please join us for the screening of Month Python’s best, most significant work. Funny, irreverent and possibly offensive to some, if you don’t think you like Monty Python, try this! Rabbi Jonathan will give an introductory talk before the film. 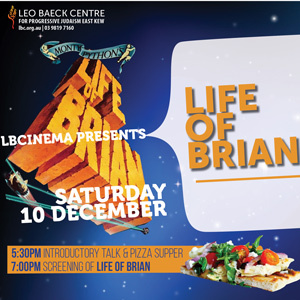 Join us for pizza supper prior to screening. Cost: Free for BM students and as part of the Shabbaton. Or $15 pizza & film/$10 film only.